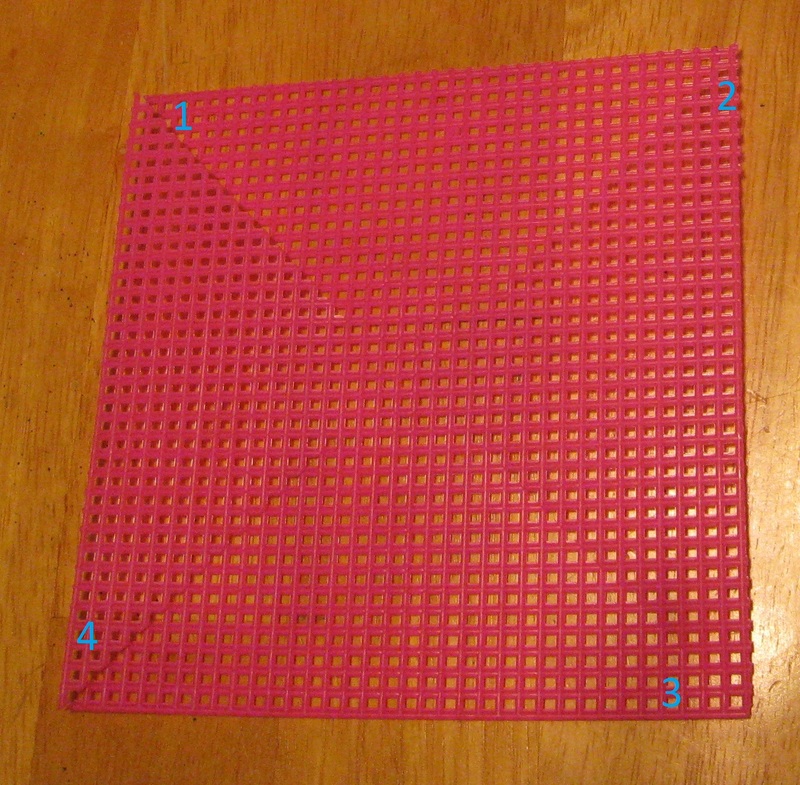 On a piece of card stock, make four squares measuring 5” X 5”, 4” X 4”, 3.5” X 3.5”, and 3” X 3”. Cut out the card stock squares. These are your templates. Trace the template squares onto the plastic canvas. You'll need one of each size. Cut out the plastic canvas squares and trim off any rough edges. Hold the 3” X 3” plastic square diagonally and cut from the corner eight squares towards the center. Repeat on all four corners. Hold the 3.5” X 3.5” plastic square diagonally and cut from the corner ten squares towards the center. Repeat on all four corners. Hold the 4” X 4” plastic square diagonally and cut from the corner twelve squares towards the center. Repeat on all four corners. Hold the 5” X 5” plastic square diagonally and cut from the corner fourteen squares towards the center. Repeat on all four corners. Curl one end of the wire with pliers. Thread one pony bead onto the wire. This will keep the plastic from slipping off the wire. 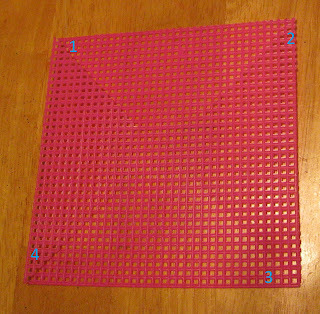 Thread the extra-large (5" X 5") plastic canvas square onto the wire at the center. Thread 5 pony beads onto the wire. Bend the plastic canvas corners in the order they are numbered onto the wire. This is how to make a pin wheel. Thread the large (4" X 4") plastic canvas square onto the wire at the center. Thread 4 pony beads onto the wire. Make a pinwheel with the plastic canvas square. Thread the medium (3.5" X 3.5") plastic canvas square onto the wire at the center. Thread 3 pony beads onto the wire. Make a pinwheel with the plastic canvas square. Thread 5 pony beads onto wire. Thread the small (3" X 3") plastic canvas square onto the wire at the center. Thread 2 pony beads onto the wire. Thread 1 pony bead onto the wire. Push down the beads so no extra wire is seen in the pin wheel. Thread on a fishing swivel. Cut the wire leaving about an inch or less. DO NOT Let Go! Curl the wire shut around the fishing swivel. Cut the plastic lacing in an eighteen inch piece. Thread the lacing through the swivel and tie with an overhand knot. You can see how to tie an overhand knot Here. This is the hanger. Cut two 24 inch pieces of flagging tape. Roll one end and insert in the bottom loop of the wire. Center the pieces of flagging tape and tie. Your pin wheel spinner is ready to hang.